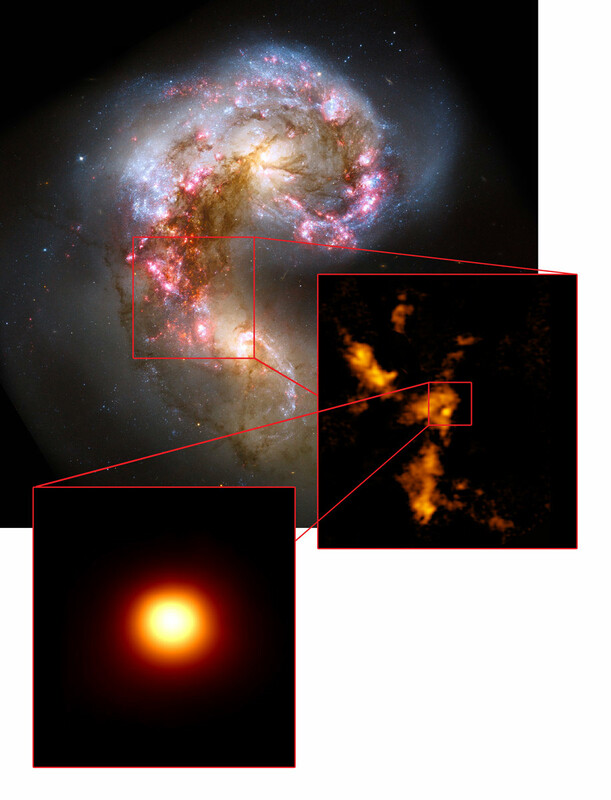 The Antennae galaxies, shown in visible light in a Hubble image (upper image), were studied with ALMA, revealing extensive clouds of molecular gas (center right image). One cloud (bottom image) is incredibly dense and massive, yet apparently star free, suggesting it is the first example of a prenatal globular cluster ever identified. Using the Atacama Large Millimeter/submillimeter Array, astronomers have discovered what may be the first known example of a globular cluster about to be born. Globular clusters – dazzling agglomerations of up to a million ancient stars – are among the oldest objects in the universe. Though plentiful in and around many galaxies, newborn examples are vanishingly rare and the conditions necessary to create new ones have never been detected, until now. Astronomers using the Atacama Large Millimeter/submillimeter Array (ALMA) have discovered what may be the first known example of a globular cluster about to be born: an incredibly massive, extremely dense, yet star-free cloud of molecular gas. This object, which the astronomers playfully refer to as the “Firecracker,” is located approximately 50 million light-years away from Earth nestled inside a famous pair of interacting galaxies (NGC 4038 and NGC 4039), which are collectively known as the Antennae galaxies. The tidal forces generated by their ongoing merger are triggering star formation on a colossal scale, much of it occurring inside dense clusters. What makes the Firecracker unique, however, is its extraordinary mass, comparatively small size, and apparent lack of stars. All other globular cluster analogues astronomers have observed to date are already brimming with stars. The heat and radiation from these stars have therefore altered the surrounding environment considerably, erasing any evidence of its colder, quieter beginnings. With ALMA, the astronomers were able to find and study in detail a pristine example of such an object before stars forever change its unique characteristics. This afforded astronomers a first-ever glimpse of the conditions that may have led to the formation of many, if not all globular clusters. Most globular clusters formed during a veritable “baby boom” around 12 billion years ago, at a time when galaxies first assembled. Each contains as many as a million densely packed “second generation” stars — stars with conspicuously low concentrations of heavy metals, indicating they formed very early in the history of the universe. Our own Milky Way is known to have at least 150 such clusters, though it may have many more. Throughout the universe, star clusters of various sizes are still forming to this day. It’s possible, though increasingly rare, that the largest and densest of these will go on to become globular clusters. The astronomers believe, however, that the object they observed with ALMA, which contains 50 million times the mass of the Sun in molecular gas, is sufficiently dense that it has a good chance of being one of the lucky ones. Globular clusters evolve out of their embryonic, star-free stage very rapidly — in as little as one million years. This means the object discovered by ALMA is undergoing a very special phase of its life, offering astronomers a unique opportunity to study a major component of the early universe. The ALMA data also indicate that the Firecracker cloud is under extreme pressure – approximately 10,000 times greater than typical interstellar pressures. This supports previous theories that high pressures are required to form globular clusters. In exploring the Antennae, Johnson and her colleagues observed the faint emission from carbon monoxide molecules, which allowed them to image and characterize individual clouds of dust and gas. The lack of any appreciable thermal emission – the telltale signal given off by gas heated by nearby stars – confirms that this newly discovered object is still in its pristine, unaltered state. 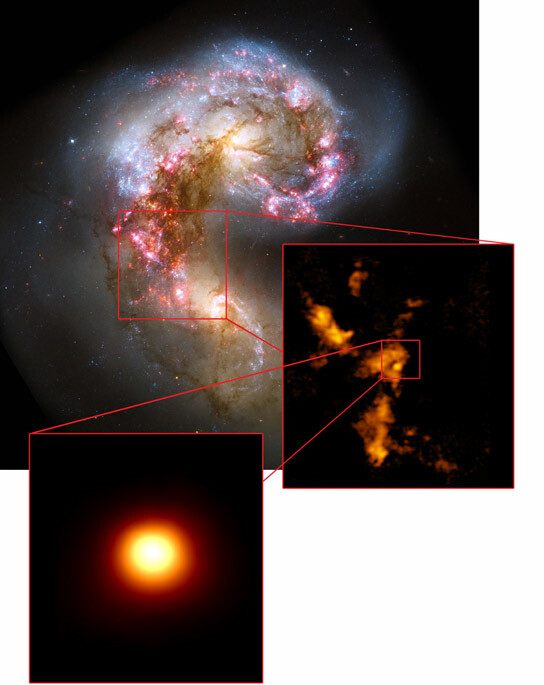 Further studies with ALMA may reveal additional examples of proto super star clusters in the Antennae galaxies and other interacting galaxies, shedding light on the origins of these ancient objects and the role they play in galactic evolution. Be the first to comment on "ALMA Discovers a Globular Cluster about to be Born"